Princess Betony’s mother is a dryad and misses the Wild Magic of the Dark Forest. When the princess sees her mother running into the Dark Forest, Betony is worried she will never return. Humans are forbidden to enter the Forest. Betony doesn’t care. She has to find her mother, no matter what. But first she must catch a unicorn! This book makes quite the change form Oblivion which I read earlier this week, while that book was huge, this one is quite small, it’s dimensions are, 149mm x w96mm. For this reason alone, it may get overlooked by school libraries because it will disappear on their shelves. While libraries may decide against this tiny treat, I think most girls would love it, because of it’s size. It has the added bonus of having on of those ribbon book marks attached to the book, which seem to be favoured by many younger readers. The story reads like a fairy tale. A princess, Betony, living in her kingdom surrounded by a well intentioned governess, the Lord Chancellor and the royal council all trying to make sure Betony behaves in a way in which a proper princess should. This includes staying away from the woods, and all things magical and mythical. This is especially hard for Betony for two reasons. One, she loves books and reading, ,but so many of the wonderful fairy tales she wants to read are off limits to her. The second reason is that he own mother is a dryad, a tree spirit, who now lives in the human world, but has a strong link to the woods and nature. When Betony fears that he mother is going to leave her, and return to the woods, Betony follows her. 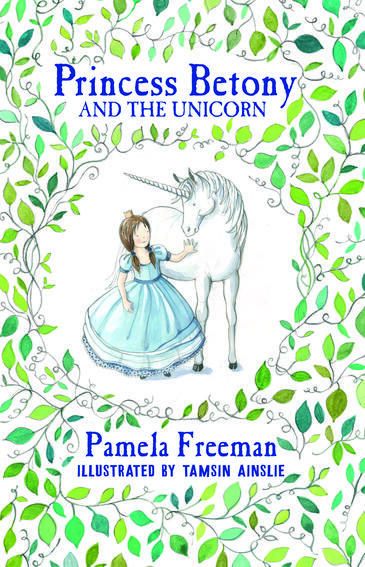 It’s here that she must past a mythical test involving nymphs, a unicorn and a wolf. She also finds out that she has a strong connection to Wild Magic, and with this…anything is possible. There is a website dedicated to the book, and what will be a new series. There are games and puzzle and you can even download the free story of how Betony’s father, a King fell in love with her mother, a Willow Tree! This will be an extremely popular story for little girls who are good readers, and I think it would also be a nice book to share with little girls who are maybe not such great readers, but still like having books read to them.